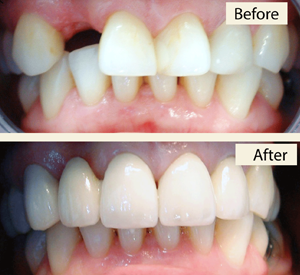 If a tooth is missing, or needs taking out, there are several ways we can fill the gap that is left. In some cases it is important to try to replace any missing teeth to balance the way your jaw bites. If you have several missing teeth, the remaining teeth are under more pressure. This can lead to broken fillings or even jaw problems. 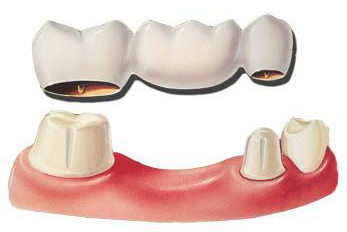 Bridges are ideal for people who don’t like dentures and only have a few teeth missing. Bridges are usually made by putting a crown on a tooth on one or both sides of the gap and attaching a false tooth in the space or middle. The bridge is solid and can’t be removed. These bridges are usually made of precious metal bonded to porcelain. Sometimes other non-precious metals are used in the base to give it extra strength. 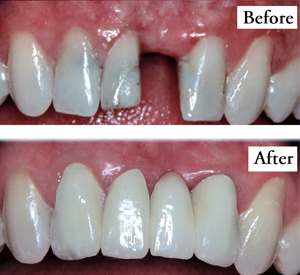 A well-designed and well cared for bridge will last many years and is a very good way of replacing one or two teeth. The good news is that bridges can reduce your risk of gum disease, help correct some bite issues and even improve your speech.